Swim Lane Maps show roles, hand-off of information, and responsibilities that help teams work together. Asking, “how are we going to get from where we are to where we want to be?” is a question of implementation. What are the concrete steps we have to take to get there? Who is going to do what, and when are they going to do it? Using Swim Lane process maps is one way to answer some of these questions. We like to organize Swim Lane process maps by putting the ‘START’ on the left and the ‘END’ on the right. It’s easier to read the chart from left to right. Organizing the Swim Lane process maps and other process maps in predictable ways, and not over-stuffing your maps with information eases communications, which is mainly why you create process maps: to communicate to others a process that you already know. 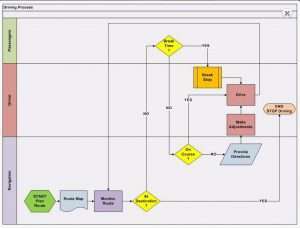 This swim lane process map shows the passenger (customer) in the first lane. Their role is mostly to ask questions. In the second lane, the driver accepts requests for breaks from passengers, and route adjustments from the navigator, who is shown in the third row. What’s In A Swim Lane? Swim Lane Diagrams organize tasks by role. A role gets a swim lane. You are responsible for every task, document or decision shown in your Swim Lane. The chart above shows three swim lanes: Passenger, Driver, and Navigator. In our swim lane maps, we always show the customer on top. To determine who goes in the top lane of your Swim Lane map, use the “but for” test. What really stands out in this Swim Lane map is that Driving and Navigation are in fact different roles. The roles are clearly distinct. Swim Lane Process Maps visually communicate how the roles relate to and communicate with one another. Swim Lane Process Maps visually communicate the involvement of each role, the Customer role for example. In simple processes, customers may provide information at the beginning of a process in the form of requirements, and at the end when they buy the product. In more complex products, customer requirements may be injected more frequently. In the case of co-development or co-creation of products, customers may have responsibility for processes and therefore process steps would appear in their swim lanes. ISO-certified organizations must gather requirements from customers. That could be shown as a requirements document, depicted in a process map as a process step box with a wavy bottom. Customer requirements could also stand alone in a separate requirements definition process. 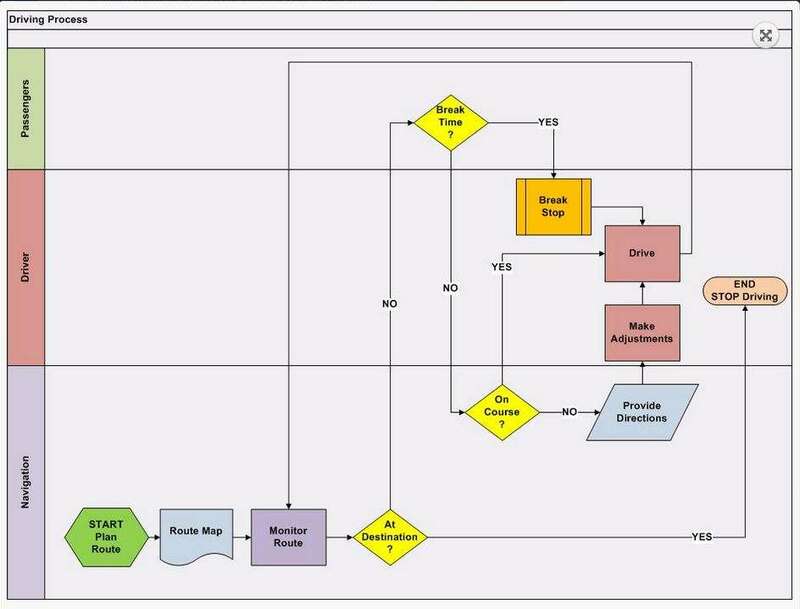 With Swim Lane Process Maps, handoffs of control and information appear as vertical lines or arrows originating from an activity in one role and connecting to an activity in another. The answer produces different actions, which is another indicator that this role is a customer.